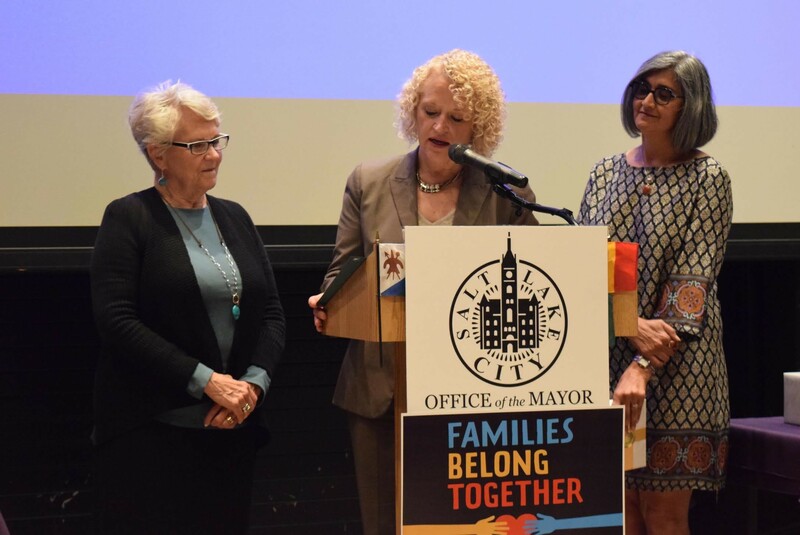 Rep. Carol Spackman Moss, left, Mayor Jackie Biskupski, middle, and Asha Parekh, director of refugee services at the Utah Department of Workforce Services, recognize refugees in Salt Lake City as part of World Refugee Day. 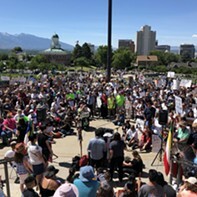 As news of separated immigrant families and children continues to singe the public’s morale, members of Salt Lake City’s refugee community took a moment Wednesday to recognize their journey and contributions to the city. To kick off the World Refugee Day celebration, more than 50 people gathered at the Sorenson Unity Center on the city’s west side for a moment of silence and reflection. 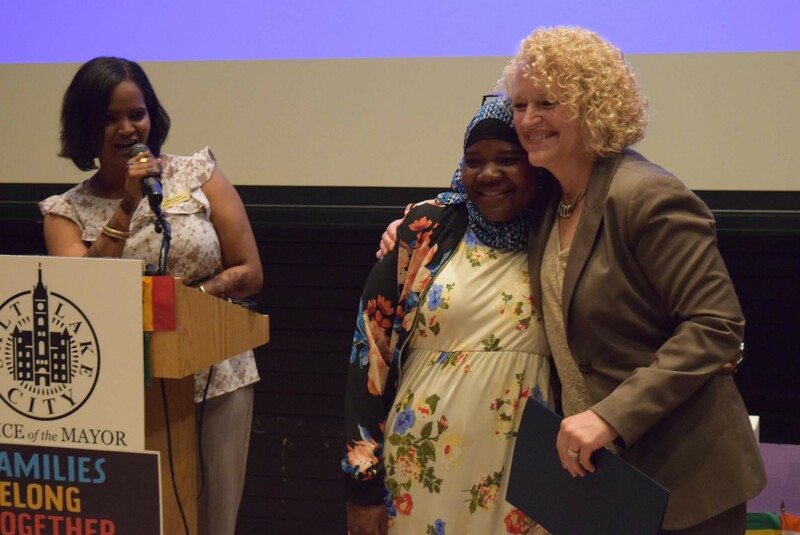 Aziza Hussein is embraced by Mayor Jackie Biskupski after receiving an award at the World Refugee Day celebration. 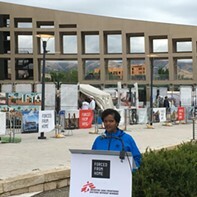 The 14th annual celebration, though, had a more somber tone this year as refugees in attendance said they felt for the families seeking to come to the U.S. One refugee, Aziza Hussein, who came to Utah from Kenya in 2004, said she has struggled with mental health and now works with others in the city to find mental health care and therapy. 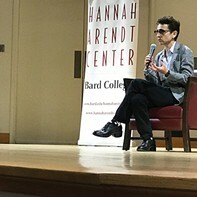 She said it’s still hard to hear what’s happening today. 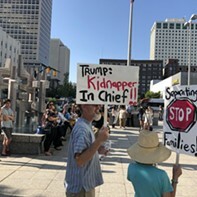 While the mayor and others recognized refugees and the work they’ve done along with the city’s Know Your Neighbor Program, House Democrats gathered at the Capitol to denounce the recent zero-tolerance policy and call for a change. At the same time, Trump signed an executive order to end the separation of families at the border, but some still wondered why it happened in the first place. Dems also called on Gov. Gary Herbert to pull National Guard members from the border and cancel any future deployments for them, according to a news release. 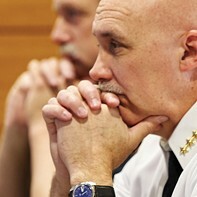 The message across town at the Sorenson Center remained hopeful, however. Two young refugees from Africa, Atteib Mohammed, 16, and Samia Ibrahim, 17, recounted their culture shock when they first arrived in Salt Lake City two and eight years ago, respectively. They shared stories of adjusting to school and how it gave them leadership skills they didn’t have before. 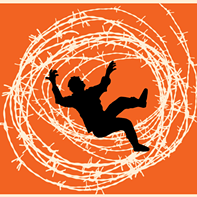 State Sen. Curtis Bramble, R-Provo, Rep. Carol Spackman Moss, D-Holladay, and community activist Lina Smith were also recognized with the Know Your Neighbor Refugee Advocacy Award for their service helping refugee communities. Bramble and Moss sponsored a bill this year that will allow refugees and others learning English to not only use an interpreter when getting their driver’s license, but when they have to renew five years later, as well. “Salt Lake City will continue to be a place of hope to immigrants and refugees coming to the United States,” Biskupski concluded.